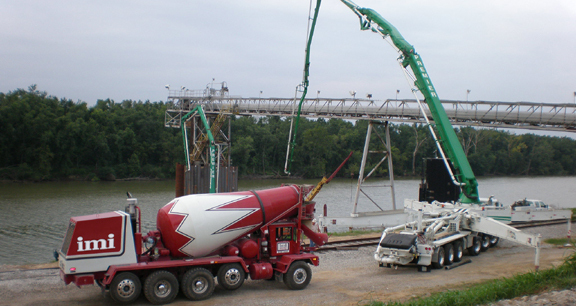 Project obstacles and solutions: Consolidated Grain & Barge hired T&C Contracting to replace pier cells at their barge loading center in Clarksville, Indiana. These cells required 300 yards of concrete and were in the middle of the Ohio River. The distance from the river bank to the piers required two pumps. One was set up on shore and the other was floated into position on a barge. Any time you pump concrete this great of a distance, and the pressure in the line is increased, there is a tendency for the fine particles in the concrete, such as sand, cement and fly ash, to segregate from the larger, coarse particles. This causes blockages in the line. It then requires tremendous effort to determine exactly where the blockage is, breakdown the appropriate line sections, clean it out, reassemble and start over. This causes lost time, lost product, messy cleanup, flaring tempers and so forth. Many contractors would water and re-temper the concrete to keep it flowing smoothly through the pump. However, this can greatly weaken the strength of the concrete. IMI technicians were able to meet mix psi strength requirements, but still keep the concrete flowing through both pumps without adding water.